Walk-behind trenchers have been around long enough to have lost their novelty. When was the last time you saw someone laying open a trench with a spade? Yet the pedestrian trencher continues to evolve, and trend lines are not yet fully formed. Ditch Witch invented the market and the name sometimes still is a stand-in for any trencher. Yet the manufacturer has proprietary features that separate it from the pack. One is the exclusively short track-long track configuration. The patent-pending CX Track system has a shorter track on the left side to accommodate the auger that deposits trenched dirt alongside the moving machine. “The shorter left track on CX models allows us to have tracks and still have a compact design,” says Christopher Thompson, product manager for compact equipment at Ditch Witch. The system eliminated a trailing rear wheel and otherwise snugged features into a more maneuverable package. Three CX tracked models are powered by 16-, 24- or 31-hp gasoline engines. “The C16X is by far the most popular model,” Thompson says. “It is the right combination of power and size.” The general market trend is for tracks instead of wheels, with some exceptions. The trend is partly attributable to the fact contractors increasingly rent walk-behind units, and tracked models are the ubiquitous choice for contractors. Ditch Witch walk-behind trenchers go out the door on tracks at least 85 percent of the time. Of the three Vermeer walk-behind trenchers, the RTX250 is a 25-hp tracked unit with hydrostatic drive that can lay open an 8-in.-wide, 48-in.-deep trench. The RTX130 and RTX200 trenchers were released in 2016. The RTX250 is the largest and a dedicated track unit. The 200 and 130 were released to capture the growth in the lower horsepower segment of the market. They can be configured with tracks or tires. Hutchinson sees a positive turn in the market for walk-behind trenchers. Toro has been a bellwether in the walk-behind market in respect to tracks. From the early stages of product development, Toro recognized that tracks would enhance maneuverability regardless of terrain. Toro subsequently was the first to offer tracks on its walk-behind machines. Its current three models still move exclusively on tracks. Barreto Mfg. may not be a household name, but it is well known within the industry as an innovative West Coast maker of hydraulic walk-behind trenchers. In fact, the company built the first all-hydraulic wheeled trencher in 1995. Today it offers several walk-behind variations in horsepower ranges from 6 to 23 hp. 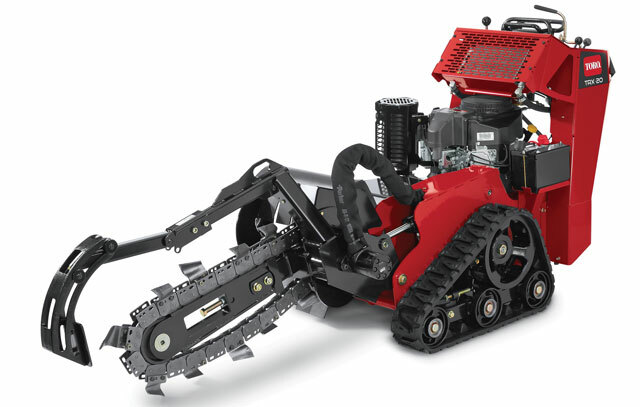 Its product line also includes a unique machine introduced two years ago that has a detachable trencher head, which can be switched out for a blade. Barreto promotes itself as the “home of the best wheeled trenchers in the world.” That seriously flies in the face of the industry’s wholesale shift to tracked walk-behind trenchers, a trend attributed in large part to the rental industry’s preference for tracks on trenchers. Barreto itself sells fully 95 percent of its trenchers to rental houses. Nonetheless, wheeled trenchers are the company’s mainstay product. “We do sell a lot of tracked trenchers,” Phelps says, “but they still don’t outsell our wheeled units. 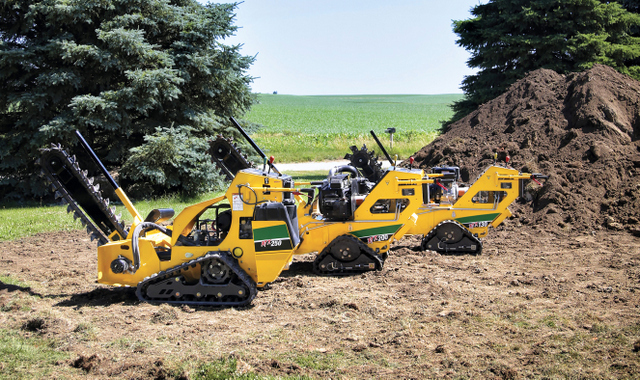 Keep in mind we have three different wheeled units, and the 712MTH and 912HM models are very popular models.” The two trenchers cited by Phelps are 6- and 9-hp units, respectively. Powered by a 5.5-hp Honda engine, the KT 200B is capable of achieving depths up to 8 in. Do you need a small and precise trench? Maybe consider Little Beaver’s Kwik-Trench mini-trencher, offered in two models, the KT 200B and KT 2400B, both able to trench up to 30 ft per minute. 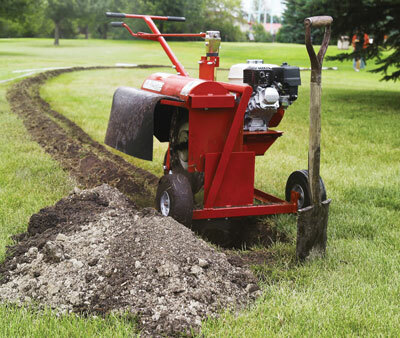 A compact design paired with durable construction and components allows the Kwik-Trench to tackle a multitude of projects, including landscape edging, root pruning, as well as installations of plumbing and drainage lines, low-voltage wiring, silt fences and sprinkler systems. Featuring carbide-tipped teeth and a powerful drive system, the mini trencher cuts through tough surfaces such as compacted clay, road fill, asphalt and tree roots up to 10 in. thick. Featuring a triple V-belt drive system, the Kwik-Trench achieves rotation speed up to 800 rpm. Precise cutting depth is achieved with a manual crank, while each trencher’s locking swivel wheel guides the unit, ensuring straight trenches. For more info, visit littlebeaver.com. Read more about walk-behind trenchers here.